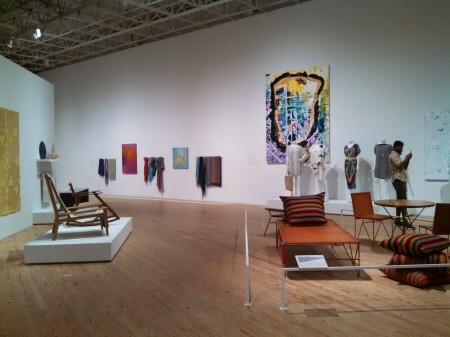 Despite featuring the work of 35 Texas designers, nothing feels jumbled about “Texas Design Now.” Impressively curated, these works satisfy on a thoroughly contemporary plane, elevating the pop appeal of the flashy images of our sound-bite assembly-line society. In truth—and I mean this as a compliment—entering the exhibition is like entering a lost dimension of an IKEA, where the furniture is unique and clothes complete your lifestyle wishes, and the “Y” of “DIY” is always an artist with the patience and craftsmanship our environment so often lacks. CAMH is the perfect place for such a show; upon entering its windowless rhombus of a building through an almost hidden entrance, the physical intention of each object comes into clear focus, and the odd corners of the building paired with exhibit walls and lighting make exploring a treat. My reference to IKEA is the most immediate example of a furniture showroom whose perfectly staged twists and turns change our perception both of ourselves and our environment. The stories told by the apparel, furniture and accessories capitalizes on our inclination to picture ourselves in a chic-er world. Except this is no Pinterest board—it’s high craftsmanship that is mostly functional, never stuffy, and, more often than not, playful and fun. While not really a “community art show,” the exhibition emphasizes community in a few different ways. Take, for example, “Gown Worn by Her Royal Highness, Princess of the Treasured Tiara of the Court of Dazzling Adornments” by Mary Lou Artz, topped with a collar and tiara by Xavier Castillo. 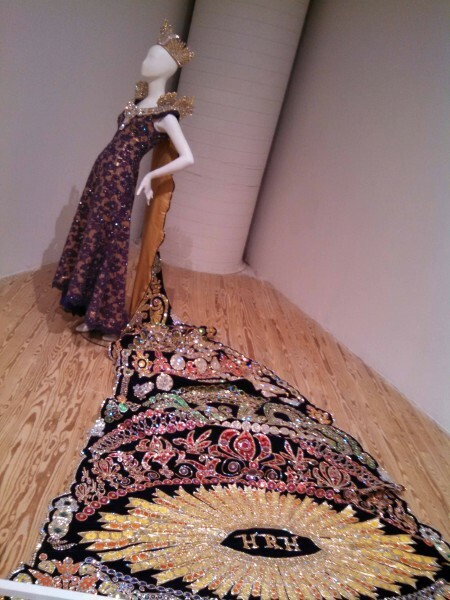 The title of the bejeweled dress and elaborate train isn’t just artsy hyperbole; the gown actually was worn by the princess of San Antonio’s annual Fiesta. The elaborate gowns of the Fiesta and quinceañeras are a hallmark of thousands of Hispanic celebrations around the state that happen every year. Not all gowns have such lengthy train, not all weigh almost 50 pounds, but the essence of flashy reverence of feminine coming-of-age remains. Another specific Texas community is represented in textiles made by The Community Cloth, a Houston organization that works with refugee women (Burmese, here) to create and sell their artistic wares. The scarves were the only pieces to be accompanied by an explanatory iPad presentation, and the women’s voices mingled with the modern-to-the-point-of-cacophonous piano soundtrack to Andy Coolquitt’s video (a photo series of objects that inspire his art) to create a very cool effect in one specific section of the room. But the true “communing” happening in “Texas Design Now” is in the tableaux featuring different media to create a diverse, textured experience. In the same way that dogs and their owners (allegedly) start to look alike after a while, the apparel and furniture of each tableau match in style and intention, as if the artists had been working together the whole time (in almost all cases, they hadn’t). The fluid flares of Michael Wilson’s Nozomi Dining Table seem almost continuous with Rob Bradford’s jarring yet elegant taxidermy duck gown. The armor-like yet natural impact of Esé Azenabor’s dress of wooden beads mirrors Wilson’s sleek table. 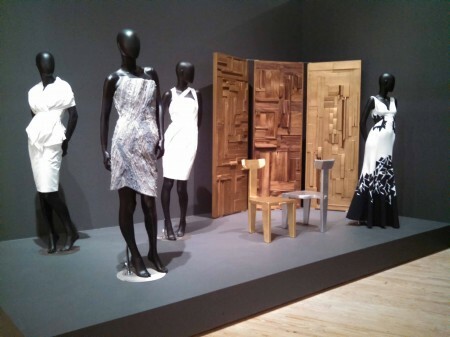 The carefully fitted wood block pattern in Peter Glassford’s parota wood screen enhances the deliberate paneling of Stephanie Montes’ sleek shift dresses. In devotion to rendering a picture complete, some paintings are included on one wall. Despite being slightly incongruous to the theme, their presence is certainly the result of good design. Manoosh’s digitally-printed cashmere scarves hang brilliantly alongside Marilyn Biles’ bright oil and pastel paintings. Two of Shane Tolbert’s paintings complete the exhibition of his collaborative fashion with Kate de Para, along with her solo pieces and Michelle Yue’s tubular acrylic jewelry. Along the more wearable fashion are pieces of true celebrity elusiveness. Rob Bradford’s dazzling headwear looks like it was pulled directly from Lady Gaga’s tour. 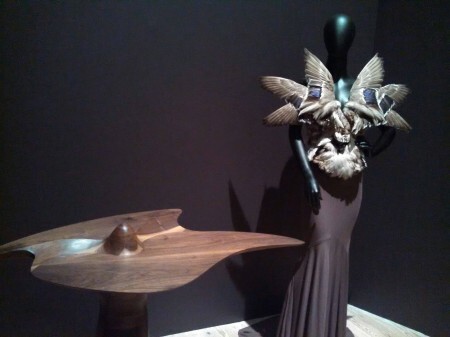 Chloe Dao, a Houston designer who won the second season of Project Runway, has two lovely gowns on display. Johnny Dang Diamond Grillz—a grill being, in this case, precious metals and jewels fashioned to fit over the wearer’s teeth—have been sported by the likes of Beyonce, Lil’ Wayne and Paris Hilton. The American Flag Grill displayed here caused a minor international controversy when swimmer Ryan Lochte wore it to accept one of the gold medals he earned at the 2012 Olympics (mostly among jewelers who disagreed about the aesthetic). Alas, the grillz were housed behind glass, and would have made of an impact—albeit a more macabre one—tacked onto a mannequin’s mouthless face. Two of my favorite details don’t fit as neatly into the compartments I’ve created in my narrative thus far. 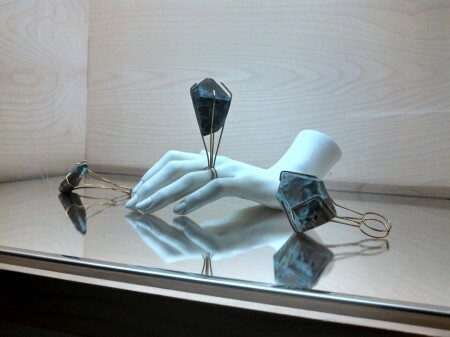 One is a series of rings by Claire Webb, featuring giant dull rocks, roughly diamond-cut, in plain wire frames. The series isn’t called “I Do,” but that was the meaning that this reviewer took away. 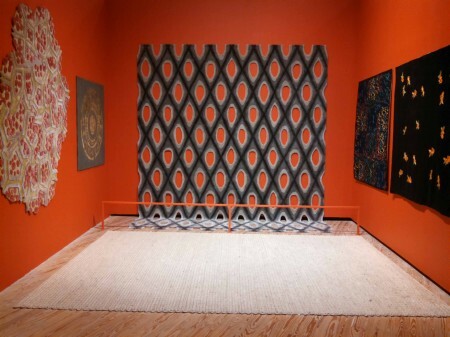 The other is an enclave of hanging rugs by Ryan Reitmeyer. The “Dirty Rug” on the floor is noted on the display placard as another piece of art, and the viewer must step onto it to get a closer view of the hanging pieces. One wouldn’t think twice about getting a closer look if that rug was not there, but titling it causes hesitation, so much so that a fine print note assures viewers that they may step onto the rug. This is the closest interaction we have with the art in the exhibit, full of pieces that could be worn or sat upon in a different context. Actually, that may fit the narrative more closely than I thought: it is our one chance for physical interaction in this exhibit, to commune where hard-edged glitz and appealingly subversive aesthetic thrives inside a different element of utility. —Joelle Jameson is a writer living in Houston, Texas.